Thompson Aerospace and WIPRO Ltd.
Irvine, California based, Thompson Aerospace is a leader in airborne IT technology with 1NetTM Secure Data Systems, Secure Aircraft Tracking, Secure Cloud/Data Center and Argus-T Secure Hardware based communication system. WIPRO is a global information technology, consulting and business process services company. Leading in harnessing the power of IoT, cognitive computing, hyper-automation, robotics, cloud, analytics and emerging technologies to help our clients adapt to the digital world and make them successful. With recent annual sales of $7.7B, WIPRO is recognized globally for its comprehensive portfolio of services, strong commitment to sustainability and good corporate citizenship, Wipro has over 160,000 dedicated employees serving clients across six continents. Wipro with its partners and customers discover ideas to build a better and a bold new future. The combined capabilities of Thompson Aerospace and Wipro will rapidly emerge as a market leader in E2E secure airborne data collection, storage, deep analytics using Robotic Process Automation and Wipro HolmesTM cognitive AI platform. 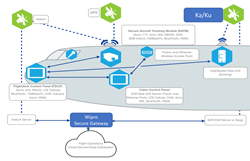 The information will be available for transmission in a secure environment to allow Airlines, OEMs and Aircraft System providers unrivaled insights into the Connected Aircraft while airborne or upon landing. This captured data, transformed into actionable information, will provide enhanced airborne services for the crew (Connected Cockpit and Cabin) and passengers (Connected Seat) as well as utilization, tracking, and condition monitoring enabling fleet planning and enhanced maintenance operations.